* ExpanDrive only supports OpenSSH files, instead of the .ppk files created by PuttyGen. When loading the public key to the remote server, ensure that you copy the public key suitable for pasting into the SSH authorized_keys file. Also, ensure that you load the private key into ExpanDrive in the format supported by OpenSSH. **Pageant is useful if you will provide a passphrase for your private key: It removes the need to enter the passphrase each time that you want to use the private key. 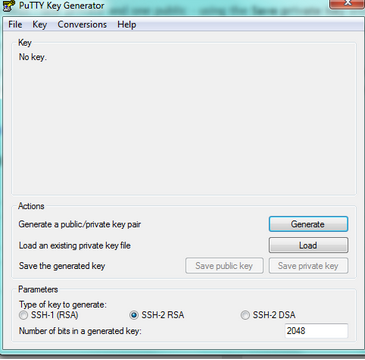 You can use the Putty utility PuttyGen to create public/private key pairs. You can keep the defaults and then click on Generate. Putty will prompt you to mouse over some grey space, in order to help create the randomly generated keys. Note: You can also provide a passphrase to protect your private key, before saving the keys. Uploading the public key to your SFTP server. You need to copy the public key in the OpenSSH format for the authorized_keys file. where “paste key here” refers to the public key in OpenSSH format. ExpanDrive only supports RSA key files that work with OpenSSH. For Windows, you will need to convert the generated .ppk file to the appropriate format. From Puttygen, click on File>Load Private Key. Click on Conversions>Export OpenSSH Key. This is the key file that you will load into Expandrive to connect securely to the SFTP server. For this procedure click here. Open a new pageant session. Press the ‘Add Key’ button. Pageant will bring up a file dialog, labelled ‘Select Private Key File’. Find your private key file in this dialog, and press ‘Open’. Now when you try to connect Expandrive to an SFTP server with pageant selected for authentication options, Expandrive will notice that pageant is running, retrieve the key automatically from Pageant, and use it to authenticate. This means you don’t have to provide your passphrase.